For this week’s post I decided to feature another one of my mom’s easy recipes that she has acquired over the years. This dessert is perfect for the summer as strawberries come back into season! A great thing about this recipe is that it doesn’t require baking time in the oven (only 10 min for the crust), so you can make this recipe and walk away without having to stick around for +1 hours. The gelatin in this ‘No Ache No Bake’ recipe helps form the dessert so you don’t have to bake the cheesecake. It is extremely light and fluffy, yet still creamy and delicious. Sometimes you just don’t have time to fully bake a cake! CRUST COMBINE: Mix all ingredients for the crust. Press into pan. You can save some crumbs for toppings too! FILLING COMBINE: dissolve gelatin in boiling water. Let cool, but don’t let set. Cream cheese with sugar. Add gelatin mixture. Add vanilla. Whip the cream. Fold into the cream cheese mixture. Spread on crust. Chill for 24 hours. TOPPING COMBINE: Thaw strawberries. In a pot over the oven – heat up the strawberries slightly & add the sugar so that they melt slightly together. Use a blender (I used a hand blender) and mix the strawberries & sugar until purred to your liking! 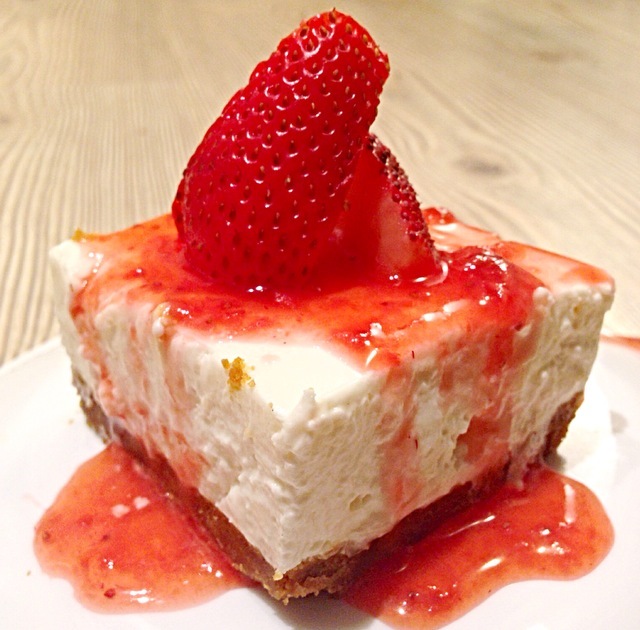 Pour onto cut slices of cheesecake. Also cut up fresh strawberries for people to add on top! Posted in Baking, CakesTagged baking, cheesecake, dessert, food, foodporn, no bake, recipes, strawberries, summer, toppingsBookmark the permalink. Me too :D . I’m going to New York soon and will definitely buy some there! !